There are only three options remaining for the Syriza government. Events in Greece have taken a dramatic turn, and insolvency is at the gates. On April 20, the Greek government issued a decree forcing local authorities to place cash reserves at the Bank of Greece. Two days later, Dimitris Mardas, the deputy minister of finance in charge of state revenue, declared that €400 million were missing to pay for pensions and salaries at the end of the month. A few hours later, he said the money was found and that he was now trying to constitute cash reserves. But according to sources, Mardas informed Syriza members of parliament at a meeting that same day that the state reserves wouldn’t be able to make all payments in May. And that’s despite, in terms of debt payments, May being a relatively “easy” month, with only €750 million due to the International Monetary Fund (IMF), plus another 400 million in interest payments. June will be more difficult, with €1.5 billion due to the IMF, €700 million to the European Institutions, and 500 million in interest payments. The burden is without a doubt untenable. But a more representative sample of the views of the two major European institutions that together hold about two thirds of the Greek debt, the ECB and the European Stability Mechanism (ESM), are to be found in the interviews given on April 22 by Klaus Regling, managing director of the ESM, and Benoît Coeuré, member of the executive board of the ECB. Both express a particularly tough line on Greece, rejecting two key demands of the Greek government in the current phase of the negotiations: no disbursement of the €1.9 billion to which Greece is entitled before the “completion of the review,” which means compliance with the type of “reforms” opposed by the Greek side (this sum corresponds to profits made on Greek debt bonds and should be repaid to Greece, according to the conditions of the ECB’s SMP program, since February). And no “gradual approach” to reforms, as proposed by Greek Finance Minister Yanis Varoufakis to allow Greece to get liquidity before June and to facilitate an agreement. Instead a “comprehensive list of reforms” is required, which should include further deregulation of the labor market and cuts in pensions, two “red lines” that the Greeks would not see crossed. Regling also explicitly opposed the current plans of the Greek government to reduce some taxes and increase the minimum wage and pensions, saying that this amounts to “moving backward” and is putting negotiations in danger. Moreover he made it clear that the disagreement goes deep since the Greek government thinks that the approach of its predecessors is mistaken, whereas according to him, “the strategy was working.” “This difference has not been resolved,” he says. It’s worth remembering that the hypothesis that despite their intimidating declarations the Europeans will at the end of the day make concessions and, to quote Varoufakis, “admit their mistakes,” is the one adopted so far, publicly at least, by the Greek government. But the soundbites coming from the creditors’ side point to something radically different: either Syriza accepts continuing the policy of the memoranda, or it will have to endure until the end the consequences of the ongoing strangulation. The Greek government’s isolation has become even more perceptible after the recent statements by President Obama and US Treasury Secretary Jack Lew urging the Greek government to move quickly down the path of “reforms” and comply with the demands of its creditors. Relations with the US have further deteriorated since the decision of the Greek government to let Savvas Xiros and other members of the left-wing November 17 armed struggle group serve the rest of their sentence out in prison, in conformity with the newly passed law on prison reform. The US reacted very strongly against what they consider “freeing terrorists,” despite the fact that Xiros is in extremely poor health. At the same time, the prospect of immediate relief coming from Russia, as a result of the recent visit of Greek Prime Minister Alexis Tsipras to Moscow, seems to have faded. The agreement on a gas pipeline that was expected to be signed this week, with a cash advance on future revenue of €5 billion, was finally postponed after Tspiras’s meeting with Gazprom’s president in Athens on April 21. At this stage, the options remaining for the Syriza government seem to be restricted to the three following ones. The “good scenario,” the one which is still favored by the Greek government, is that the Europeans will make concessions, and a compromise will be reached very soon. However, as the IMF president made clear, in order to get the €7.2 billion at stake in this four-month bridge agreement, Greece needs to get a positive “review” and to conform fully to the “reforms” agreed by to its predecessors. In any case, this possibility has already been explicitly ruled out by European Commission President Jean-Claude Juncker, German Finance minister Wolfgang Schäuble and others, who made repeated statements these last days saying that the only deadline to be considered is now June 30, and that no money will be transferred to Greece before a “big deal” — in other words, another “rescue package” coming with the usual conditions. The Greek government gives up. This is of course the avowed aim of the Europeans. But in a recent interview with Reuters, Tsipras made it clear that there are “political, not technical disagreements” on four key issues: labor legislation, pension reform, a hike in value-added taxes, and privatizations, which he referred to as “development of state property” rather than asset sales. Making concessions on that bottom line would amount to surrender and to political suicide for Syriza. 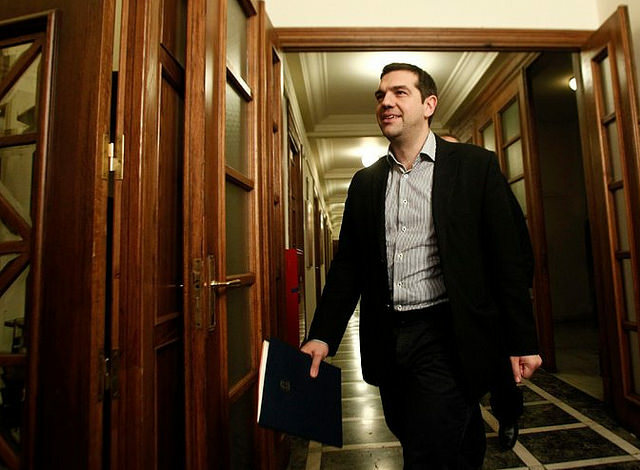 The Greek government defaults on the debt. In a recent interview with the Huffington Post, Varoufakis said that if the government had to choose between paying its creditors and paying salaries and pensions, it would prioritize the second option. But of course such a choice means a decisive rupture and exiting the eurozone (the scenario of a double currency within the euro cannot last for more than a few weeks at the very best). The complication here is that defaulting in May means defaulting on IMF repayments, and this can entail enormous complications at the level of trade (the IMF can take sanctions that will make access to private credit for trade nearly impossible). Greece should preferably default on the ECB/EFSF loans, but these repayments are due in the summer and it seems nearly impossible to hold firm until then. It is impossible at this stage to formulate which of the two last scenarios, the only realistic ones, will prevail. The signals sent by the government these last weeks are increasingly contradictory: on the one hand, the dominant tone is that of confidence and optimism about the possibility of reaching an agreement that would materialize the “honest compromise” which is now Alexis Tsipras’s aim. Contradictory statements have also been made on the issue of a referendum in the case of a failure in the negotiations process. Such a move appears necessary since it is true that Syriza’s mandate doesn’t address such a possibility and has been explicitly based on the hypothesis of breaking with austerity while staying in the euro. In recent statements, senior ministers such as Varoufakis and Alekos Flabouraris, who is the state minister and is close to Tsipras, referred to that possibility, only to be contradicted by other Syriza figures such as the member of European Parliament, Dimitris Papadimoulis. The state of public opinion reflects this uncertainty. The enthusiasm and the combative spirit of the first three weeks have now given way to a mixed picture: the support for the government’s strategy is still high, but significantly below its level of the previous months. There is calm in the streets. The recent mobilizations seem restricted to certain sectors (the anarchist milieu and local communities against gold mining in Skouries, in Northern Greece) and their effects contradictory: the anarchist agitation accelerated the vote in parliament of a bill liberalizing the conditions of imprisonment and ending the “high security” prison regime. But the situation looks more confused in Skouries, with the police turning against the demonstrators and the workers of the gold mines marching in Athens to support the continuation of the extraction, strongly backed by their Canadian-owned employers and the right-wing opposition. The main element fueling this troubled atmosphere is, however, the fact that the scaremongering on the theme of the “Grexit” remains unchallenged at the level of broad public opinion. The right-wing opposition and the mainstream media, increasingly hostile to the government and using all possible arguments to push it towards full surrender, associate the break with the eurozone with an apocalypse — as they have done relentlessly since the start of the crisis. But the response on the part of the government tends to be that this perspective will be avoided thanks to the “honest compromise” to which the Europeans will finally have to agree. Hardly a discourse, to say the least, that can mobilize Syriza’s base and prepare society for an eventual rupture with Europe. With the Communist Party still firmly holding to sectarian opposition, and its secretary general declaring that it would refuse any support to the government even in the case of a break with the eurozone, and the far-left Antarsya repeating that the government has already surrendered, it is the responsibility of Syriza’s left to propose the only sensible approach that could avoid failure: holding firm on the line of confrontation with the EU and prepare the popular movement and Greek society more broadly to embark on a radically different trajectory, both at the domestic and at the international level.